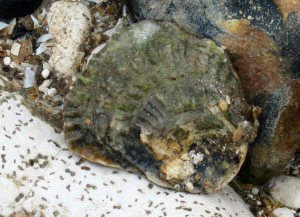 Observation - Native Oyster - UK and Ireland. Description: This is the first Native Oyster, I have found here. The pacific Oyster has just taken over here on this part of the Kent coast. This is a rarity indeed in these parts. New to me. This is the first Native Oyster, I have found here. The pacific Oyster has just taken over here on this part of the Kent coast. This is a rarity indeed in these parts. New to me.